Last Thursday, as soon as the news broke that Rian Johnson had been tasked with creating a brand-new trilogy of Star Wars films, I ran a Twitter poll of a few of the more popular spinoff ideas that have been floating around the last few years. 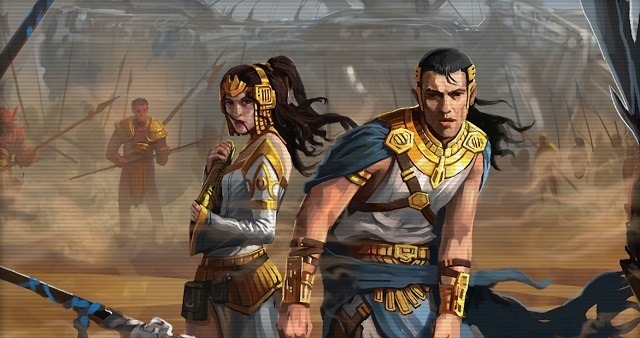 To no one’s great surprise, the winner was “Ancient Republic”, with more than three-fifths of voters opting for that (admittedly broad) premise over any other choice, even literally “other”. I followed that up with a more specific poll, and a strong plurality voted for a trilogy revealing the origins of the Jedi Order. That certainly looks like a plausible option as well, with The Last Jedi seemingly about to shed some light on how the Jedi came into being (and what made Luke all mopey about it). So I guess I shouldn’t be surprised that, when I asked the staff to pitch me their ideas for a spinoff trilogy, I got three stories roughly involving, well, the origins of the Jedi. Here’s what they came up with. The early days of hyperspace travel. Before a galactic senate has been established, corporations are sending out ships to discover new planets and exploit their resources. But one region of the galaxy is shrouded in mystery, and both expeditions have failed to return. Strong energy readings have been detected, indicating a highly valuable power source. Explorer Captain Jessica Henwick (finally getting her starring role) leads a crew of specialists on a dangerous mission to investigate. Among them is the state-of-the-art droid Huyang (David Tennant), and a mysterious man played by Ben Daniels. The first movie is space horror in the vain of Event Horizon or Sunshine – they find one of the missing ships, where the crew have been killed by a race of aliens who appear to have magical powers. The big revelation – Daniels is part of a mysterious new start-up religion that began on Ahch-To, called the Jedi, and was sent by his fellow believers to investigate dark powers flowing from this region of space. His own powers – similar to those of the creatures – lead to a lot of distrust within the crew. Sarah: Personally, I would love to see a trilogy that really leans into “fantasy” aspect of space fantasy. Perhaps this is a side effect of my year-long trip down the Tolkien rabbit hole, but something with a grand, mythic, almost high fantasy Lord of the Rings style would make a great Star Wars trilogy. It would be a classic struggle of the light side versus the dark side, but before there were things like “Jedi” or “Sith.” In the early days of the galaxy, perhaps you could say that the Force was more potent, more raw, and instead of going up against evil manipulators like Palpatine or Snoke, it’s someone who embodies the shadow of the dark side. 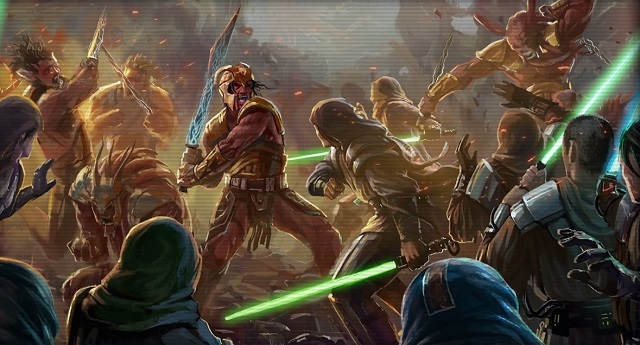 Though the announcement specified that this would be new characters and unexplored time periods, my mind is still drawn to the idea of a villain akin to Vitiate from the Old Republic era, who lived for thousands of years by draining the life force of others and sought to consume the entire galaxy in order to achieve immortality. The first third of the trilogy could be about the growing shadow somewhere in the galaxy; various Force sensitive beings are drawn together by the sensing of this power and of course some would choose to fight and some would choose to ally themselves with the dark in the hopes of gaining greater power. The second and third parts of the trilogy would be the fight against the dark, culminating in a final stand by the light side to defeat the shadow. Perhaps then it could hint at the formation of what would become the Jedi Order, for while the light side is victorious, they also know that the shadow is not truly defeated. The dark side will rise again and they have to be ready. In essence, something that leans heavily into the mystical side of Star Wars and is set far in the past, away from the rest of the movie canon. Star Wars is, after all, a space fantasy and I think it would be neat to see just how fantastical it can be. David: I suspect that we are going to get something along the lines of what Mark and Sarah have proposed, something very high-fantasy set in the far past, not just because fans seem very interested in such a thing but because we’ve been told over and over that The Last Jedi includes some revelations about Jedi and the Force, and I wouldn’t be surprised if talk about this new trilogy arose from Rian’s work with these concepts. So yeah, as much as I’d like to see something truly bizarre done with Star Wars, I’m also going to go with Old Republic. So here is some fanfic! Let’s start with a very mythical story, with a team of three Jedi fighting in a galaxy-spanning war against an order of Force knights that we are going to call the Bendu Knights, because why the hell not. At this point the Jedi are already the defenders of the Republic, but they are more militant. I picture a universe with massive industrial-looking ships, and with Jedi and Bendu Knights wearing bulky rusty armor that wouldn’t be out of place in a 1980s anime series and of course using crossguard lightsabers. In the middle of this massive battle, one of our Jedi would have a Force vision, like Joan D’Arc: she would see an old relic that can bring peace to the galaxy. So let’s call her Joan, and she’s the heroine of this first movie. The Jedi Council would oppose her abandoning her post to chase after some nonsense, so she would go AWOL and her two friends (one of them her lover) would accompany her. The Bendu would learn about this and send an assassin after this brave trio. What would follow would be a very Arthurian story of three knights looking for the Holy Grail and fighting monsters, deadly traps and their own weaknesses. 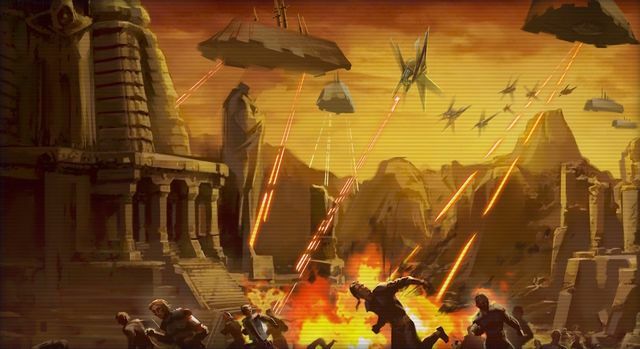 They would return to the Republic with this relic, that of course would turn out to be some kyber superweapon, and devastate a massive Bendu fleet, being hailed as heroes. The second movie would pick up ten years later and see a darker galaxy and our three heroes in very different places. Joan would have become politically powerful and the head of the Jedi Council, growing more arrogant by the day; her former lover (let’s call him Mopey) would have abandoned the Jedi Order, unable to cope with the death of so many people at the hand of the superweapon they brought to the Republic; and the last one (let’s call her Kate) would have become an embittered fighter, drawn further and further into the war against the Bendu. This movie would follow Mopey trying to find a peaceful solution to the conflict and joining forces with a Bendu Knight that I’m going to call Judas, and would end with a duel between him and Joan, who would righteously denounce him as weak and a traitor to the Republic. Mopey would tragically fall at the hands of his former lover, and as a result of her having found out about this “conspiracy” Joan would be hailed as a hero and would become the new Chancellor of the Republic. Tragedy! Politics! The last chapter would follow Kate, the last Jedi of our trio, as she realizes that war will always end in disaster (let’s honor Lucas’s pacifist tendencies in the prequel trilogy) and show us a galaxy devastated by the use of kyber weapons by both Jedi and Bendu. Kate would meet Judas, and both knights would travel to some Force planet while evading Joan’s agents and learning to cooperate with each other. This last episode would end with Kate and the Republic defeating the Bendu and declaring the birth of a new empire in the galaxy: the Sith. Kate and Judas would learn of the Prophecy of the Chosen One that would bring an end to the Sith, and create in isolation a new Jedi Order, ascetic and peaceful, to avoid dragging the galaxy back into obscurity. And, of course, this world would be Ahch-To. And this way we would leave an open door for a sequel trilogy. The perfect crime. Interesting ideas, particularly the Pioneers one! The only one I take issue with is the notion of introducing a character like Vitiate from The Old Republic game into canon. It was a terrible concept even in Legends. I know I’m in the minority here, but I’m less interested in an “origins of the Jedi” story (I expect I was one of the few disappointed to see Ostrander and Duursema pivot from Legacy to Dawn of the Jedi). Of these three, I’d be most interested in David’s Joan of Arc-to-Sith trilogy, in part because it doesn’t deal with the actual birth of the Jedi (even if it ends in their rebirth–I nice bit of misdirection, that). I’d be okay with an Ancient Past tale, but I’m just not that interested in a “discovery of the Force” / “So-and-so was the first-ever Jedi” kind of story. I will fully admit that given that we’ve established Ahch-To as the birthplace of the Jedi and from what we know about Rian Johnson’s The Last Jedi, an “origins of the Jedi” story is smart speculation. Personally, I’d be much more interested in a trilogy set maybe 100-200 BBY, during the apex of the Jedi and the Old Republic. Or a story about Jedi during the Dark Times, on the run and trying to figure it what it means to be a Jedi in this world (I’ll call this the Halagad Ventor Trilogy). Or an ensemble bounty hunter trilogy with limited or no references to the Force. Or an exploration of the time between Return of the Jedi and The Force Awakens. Looking at the writing on the wall, though, if this is an “origins of the Jedi” story, these would all be worthy contenders for how to handle that.